Purists will insist that burgers must be made with beef but other types of patties can be equally tasty. Here, some especially delicious ones. 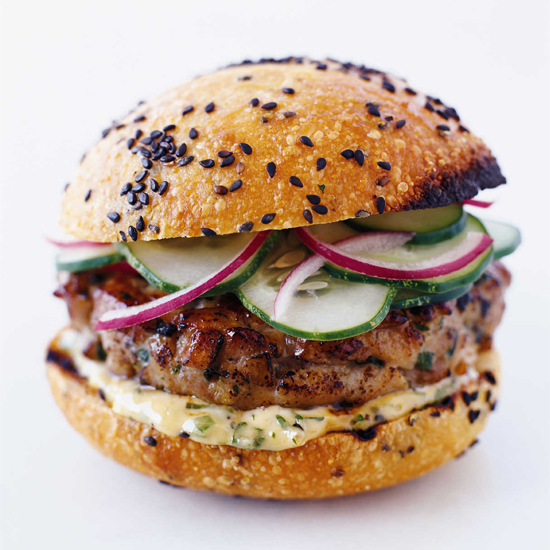 Inspired by a dumpling filling, these juicy pork burgers are loaded with ginger, lemongrass and fragrant herbs. Greek, North African, Indian and Middle Eastern flavors are terrific with lamb burgers. Try the patties with feta and green harissa (chile sauce) or a spicy yogurt sauce. The secret to a delicious chicken burger is to season it well and top it with a flavorful condiment, like this spicy peanut-coconut sauce. Same goes for turkey burgers, which are leaner (and thus, often drier) than their beef counterparts. Try them with Mexican-style seasoning, avocado and a chipotle salsa or with Gouda and horseradish mustard. Make a sausage-like patty by generously seasoning ground pork before grilling and topping with Gruyere, mustard and arugula. Thai-inspired flavors, like ginger, garlic, chiles, fish sauce, cilantro and basil are especially good in a tuna patty. Green goddess dressing isn’t just great on iceberg lettuce. It’s also a genius topping for a salmon burger. Using a mix of vegetables, beans and grains, including some that are pureed and some left chunky, creates a multi-textured meatless burger. For a more “meaty” flavor, use black beans as the base.